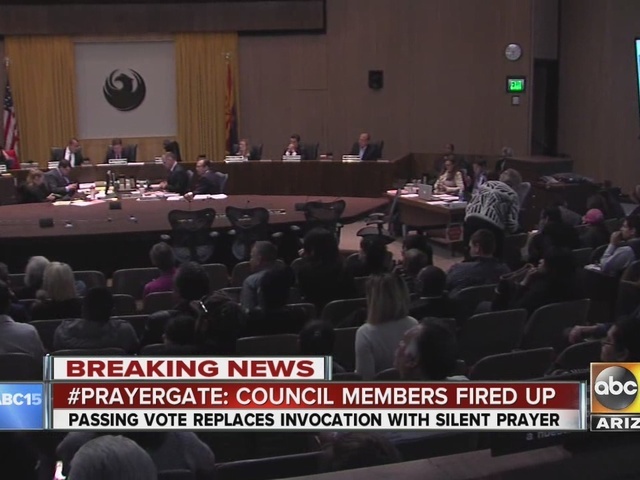 The Phoenix City Council voted Wednesday to replace a longstanding tradition of prayer before meetings with a moment of silence prayer, preventing an address by a group with "Satan" in its name and averting a lawsuit over constitutional rights. The moment of silence prayer was offered as an alternate motion to a measure that would have allowed the mayor and councilors to take turns in selecting who gives the invocation. That measure would not have blocked The Satanic Temple's prayer scheduled for Feb. 17, city attorney Brad Holm said. Satanist Michelle Shortt wanted to say a prayer at the February 17 meeting. In the video player above, she reads the exact prayer she would have delivered. In light of the City Council's vote, Shortt will not deliver the prayer. More than 50 people, including religious leaders, gave emotional testimony, invoking scripture, the U.S. Constitution and their own deity to sway the decision. Many warned against the dark forces of evil, while others urged the council to be inclusive of minority views. Stuart de Haan, a Tucson lawyer who belongs to the temple, said late Wednesday that the group wanted the same right to pray as dominant religious groups. 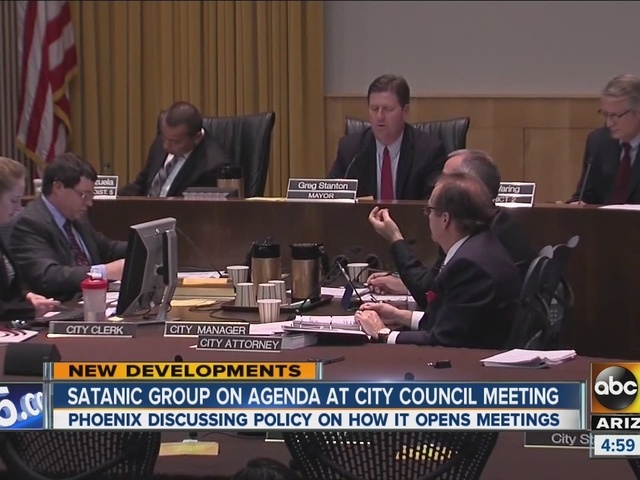 The Tucson-based group doesn't worship any deities, including Satan, de Haan said, but it is opposed to religious tyranny. The council's decision ensures everyone is treated fairly, de Haan said. "I encourage any Satanist to go have their moment of silence or anyone else," he said. Councilwoman Thelda Williams offered the alternate motion that passed, later saying she didn't think the city should waste money defending a lawsuit it was sure to lose. Councilmembers Sal DiCiccio, Michael Nowakowski and Jim Waring questioned whether Holm was giving them sound advice regarding a potential lawsuit over constitutional rights. 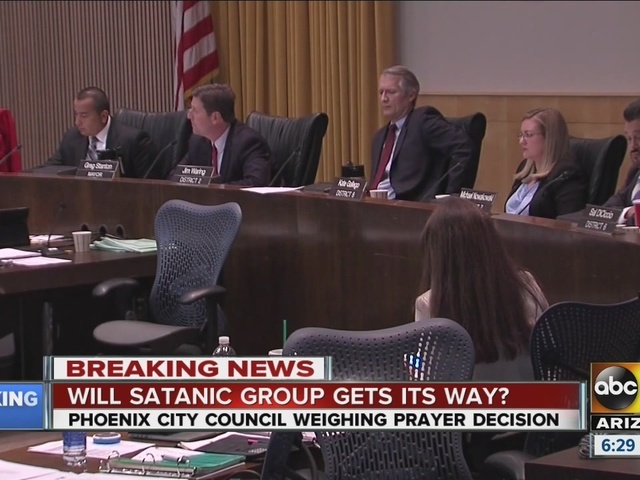 They said they support opening prayers by people who contribute to the betterment of the city and appeared shocked to learn that the original measure wouldn't have the desired effect in keeping the Satanists from delivering a two-minute prayer. "What is going to happen is: There's no other compromise," Nowakowski said. "We're ending prayer. To me, that's wrong." DiCiccio vowed to take the issue to voters. The city Commission on Human Relations said Monday in a statement that de Haan's group should be allowed to deliver the invocation because the defense of religion requires fair treatment of all. The commission also urged the council to "reconsider the inclusion of any religious invocation at public meetings."